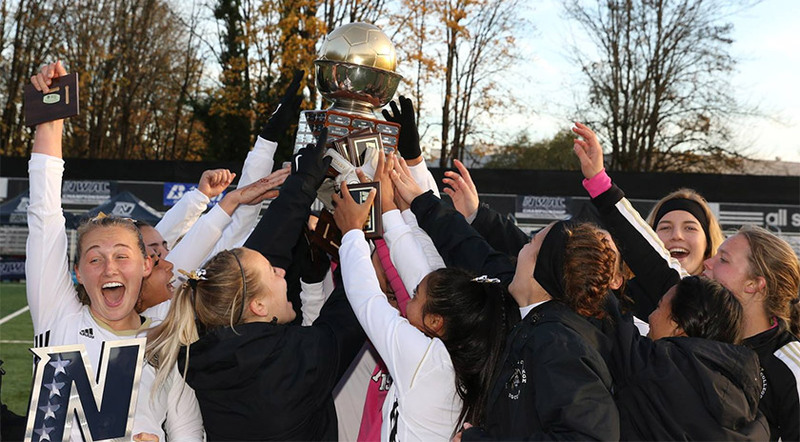 Clark College’s historically dominant defense finally faltered Sunday afternoon, as the second-ranked Peninsula College Pirates claimed the NWAC women’s soccer championship by a score of 2-0. In a dominant run, the third-ranked Clark College Penguins have allowed just one goal in the last thirteen games. It took just four minutes for the second-best offense in the conference to beat them. A perfectly-placed free kick off the foot of sophomore Halle Watson found the head of sophomore Samantha Guzman, and the back of the net. The entire team rushed her; even sophomore goalie Andrea Kenagy ran across the field to join the frenzy. Kenagy was named the tournament’s Most Valuable Player after the game. Though she stands just 5’ 3”, Peninsula head coach Kanyon Anderson said she makes up for it in other ways. “Her spiritual presence is huge, she stands back there like a giant. We’re lucky to have her back there for us,” Anderson said. In the fifteenth minute, an even more impressive goal was scored. Sophomore Emilee Greve took a corner kick and curved it directly into the far upper corner of the goal, just past the reaching hands of Clark goalie Maggie Higgins. “I was looking to get it back post and saw Halle running, but it just went in,” Greve said. The high-powered Peninsula offense unleashed a torrent on Clark early, with ten shots and seven shots on goal in just the first half. Though the Penguins’ defense was more vaunted coming in, it was the Pirates’ defense who dictated the game. They smothered Clark’s offense, with a defender seemingly immediately swarming the ball, breaking up most attacking plays in the midfield. “I think we’ve had a really underrated defense all year…[but] it’s the best defense I’ve ever coached,” Anderson said. In particular, Anderson mentioned his center backs as standouts on a defense full of them. Clark was held to just a pair of shots in the first half. They laid on the pressure in the second half, unleashing a flurry of shots and chances in the last fifteen minutes. But Kenagy held strong, notching 6 saves to lock the game down. Peninsula didn’t have an easy path through the tournament. They faced an impressive Highline Community College team that was ranked No. 12 in the country and tops in the NWAC, but still delivered a trio of shutouts. 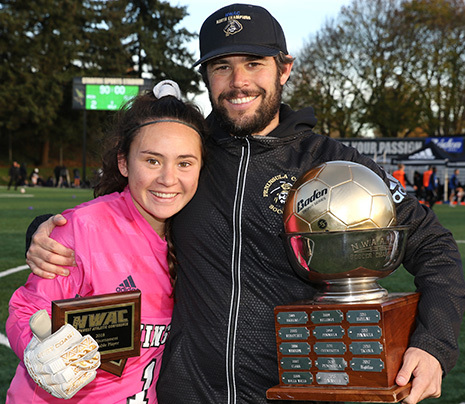 With their fourth championship, Peninsula becomes the winningest program in NWAC history, despite being started just nine years ago.